Russian city; capital of the government of the same name; situated on both banks of the Düna. It was probably founded before the tenth century, and is mentioned in Russian chronicles as early as 1021. Being included in the territory known as White Russia, it became a part of Lithuania in 1320, and about 1435 came into the possession of Casimir IV. This king restored many of its ancient privileges in 1441, particularly those concerning freedom of religious worship. Vitebsk suffered much in the wars between Lithuania, Poland, and Russia. Between 1502 and 1536 it was repeatedly pillaged by the different armies, and its commerce was greatly reduced. In 1654 after a siege of fourteen weeks the city was occupied by the Russian troops under Sheremetyev; it paid levies to Russian, Polish, and Swedish troops from 1700 to 1708; and it was finally burned in 1708 at the order of Peter the Great. In 1772 it became a part of Russia, and in 1802 it was made the capital of the government of Vitebsk. Jewish traders undoubtedly came to Vitebsk in the fifteenth century and possibly much earlier, although it is uncertain whether a community existed there before the sixteenth century. Documentary evidence shows that the inns and taverns of the city were leased in 1522 to the Jew Michael Yesofovich of Brest. In 1551 the Jews of Vitebsk are mentioned among those exempted from the payment of the Serebszczyzna, and reference is made to individual Jews of Vitebsk in 1555 and again in 1594. In the grant of the Magdeburg Law to Vitebsk by King Sigismund III. in 1597 it was expressly stated that, in accordance with the ancient law, Jews could not become permanent residents of the town. As in many other places, the burghers of Vitebsk, in order to get rid of their formidable commercial competitors, evidently sought the aid of laws that had become obsolete. It is not known how successful this measure proved in excluding the Jews from Vitebsk, but from documents dated a few years later it appears that Jewish merchants continued to live in the city. Thus in the customs records of Vitebsk for 1605 mention is made of Matys Germanovich and Sir Jacob Ilinich, both local Jews, the latter evidently being a man of some distinction. The same archives also show that Jewish merchants from other localities resided in Vitebsk for more or less prolonged periods. In 1627 the waywode Simeon Sangushko granted the Jews of the city permission to build a synagogue on their own land in the town or in its outskirts, this being in accord with royal privileges and in harmony with charters of former waywodes of Vitebsk, where the Jews had had synagogues in earlier times. This grant also provided for the exemption of the land and buildings of the synagogue from the payment of taxes. Formal entry of this privilege was made in the city records of Vitebsk in 1630 at the instance of the Jewish leaseholder Judah Yakubovich. It is clear, therefore, that, notwithstanding the Magdeburg Law of 1597, Jews continued to live in Vitebsk, and that they possessed an organized community there in the sixteenth and possibly also in the preceding century. The permanent residence of the Jews in the city was legalized in 1634 by an edict of Ladislaus IV., who issued it in response to the solicitations of Samuel and Lazar Moiseyevich, "the king's servants." It is expressly stated in this edict that the rights granted by it were only a confirmation of earlier privileges which permitted the Jews to buy and own land and houses in Vitebsk, and to have synagogues, cemeteries, and the like in the city. General Sheremetyev, who entered Vitebsk at the head of the Russian army in 1654, refers to the Jewish school (synagogue) in his enumeration of the Catholic and Unitarian churches of the city. The hardships of the siege which preceded his occupation of Vitebsk bore heavily on its Jewish inhabitants. They took an active part in the defensive operations by supplying men, provisions, ammunition, building materials, money, and houses for the quartering of the soldiers. As a punishment for their loyalty, they, together with the Shlyakhta, were imprisoned by Sheremetyev, and were later transported to Russia, where they suffered severely from ill treatment, many of them dying of hunger and cold. After a term of imprisonment at Novgorod the survivors were sent to different towns, and finally to Kazan on the Volga,whence they gradually found their way back to their native town. The property of some of those who died in captivity was presented to the churches of Vitebsk; there is a record, accordingly, of a house and parcel of ground which had formerly belonged to the Jew Mordecai who died in Moscow, and which was given by King John Casimir to a local church. Those who returned from Muscovite captivity complained in 1670 that much valuable personal property and many important documents had been left in the keeping of Christian citizens of Vitebsk, and that these had all disappeared during their absence. They were thus unable, in the absence of documentary evidence, to regain possession of their property. 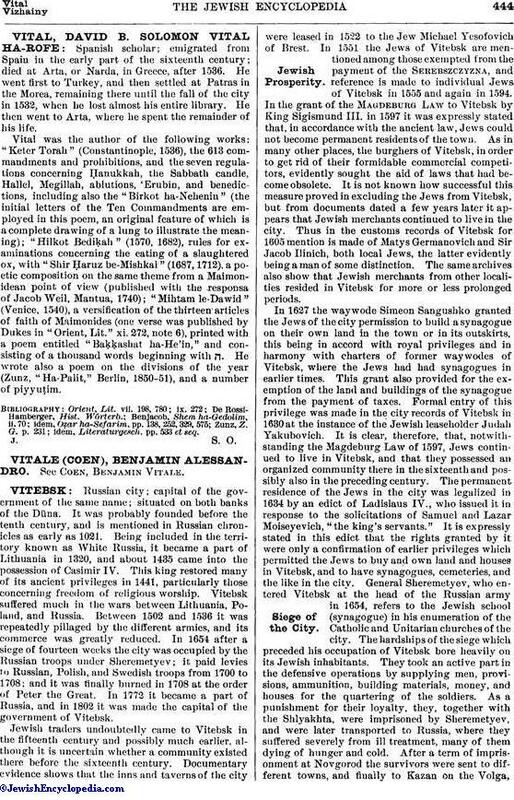 In 1897 Vitebsk had a Jewish population of 39,520 in a total of 65,871. The community possessed several synagogues, many houses of prayer, several schools for boys and girls, a rabbinical school, a Talmud Torah, and a Jewish hospital. Extensive trade was carried on by the Jewish merchants with Riga and foreign countries, the chief articles of export being breadstuffs, flax, hemp, beet-sugar, and timber. The Jews were also prominent in manufacturing industries. Hundreds of Jewish tailors were employed in the making of clothing sold in the stores of a number of large Russian cities. An important contribution to the Jewish industries was made in 1897, when a Jewish machinist established a small shop for the manufacture of plows. By 1905 the annual output was between 25,000 and 35,000 plows, all made by about 400 Jewish mechanics in five factories. 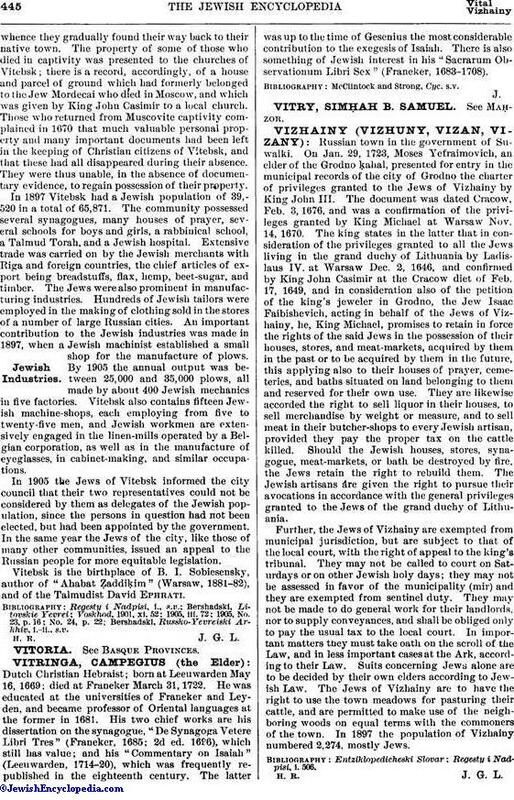 Vitebsk also contains fifteen Jewish machine-shops, each employing from five to twenty-five men, and Jewish workmen are extensively engaged in the linen-mills operated by a Belgian corporation, as well as in the manufacture of eyeglasses, in cabinet-making, and similar occupations. In 1905 the Jews of Vitebsk informed the city council that their two representatives could not be considered by them as delegates of the Jewish population, since the persons in question had not been elected, but had been appointed by the government. In the same year the Jews of the city, like those of many other communities, issued an appeal to the Russian people for more equitable legislation. Vitebsk is the birthplace of B. I. Sobiesensky, author of "Ahabat Ẓaddiḳim" (Warsaw, 1881-82), and of the Talmudist David Ephrati. Bershadski, Russko-Yevreiski Arkhiv, i.-ii., s.v.